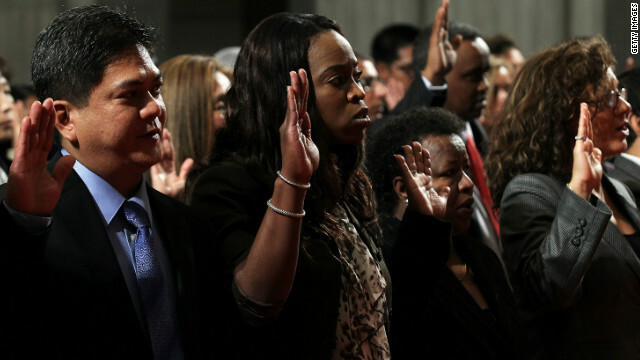 New citizens are sworn in during a ceremony in Washington, D.C.
Editor's note: Philippe Legrain is the author of "Immigrants: Your Country Needs Them" and "Aftershock: Reshaping the World Economy After the Crisis." Follow on Twitter @plegrain. The opinions expressed in this commentary are solely those of Philippe Legrain. It is no longer acceptable to discriminate against people on the basis of a whole range of characteristics that they happen to be born with, notably their gender, their race and their sexuality. So why is it still deemed acceptable to discriminate against people on the basis of where they happen to have been born? The world is anything but flat: the biggest determinant of your life chances is not how talented you are or how hard you work, it is where you were born and who your parents are. Anyone lucky enough to have been born in the United States who doubts this should try to imagine how different their life would have been if they had been born in Africa. Zakaria: Will an immigration deadlock make the U.S. a second-rate nation? A hard-working entrepreneur born in a remote African village has far fewer opportunities to achieve his dreams than a lazy dimwit born in America. Even if the African seizes all her chances and the American none, the American is still likely to enjoy a more comfortable life. And the surest thing that African could do to transform her (and her family's) life chances is to go and work in the U.S. But only if governments allow her to. Unfortunately, we live in a system of global apartheid, where the rich and the educated can move about increasingly freely, while the poor are expected to stay put, like serfs tied to the land where they were born. Can the U.S. learn from other countries' immigration policies? For the most part, people are oblivious to the injustice of this: it is seen as part of the natural order of things, like slavery once was. But insofar as people try to justify this unnatural and unjust state of affairs, they claim immigration controls are necessary to protect people in rich countries from their poorer brethren. Yet if one thinks a bit more carefully, one realizes that these objections don't stand up. One objection to allowing women into the workplace was that they would take jobs away from men. But in practice, women have not deprived men of work. Why? Because people don't just take jobs, they also create them, when they spend their wages as well as in complementary lines of work. The same is true, of course, of immigrants. Another objection is that immigrants will all end up on welfare – as if someone enterprising enough to uproot themselves to move to America will suddenly want to do nothing, even though they could earn more working. Indeed, when immigrants are working, they're accused of stealing "our" jobs and when they're out of work, they're accused of scrounging from the state. They can't win: they're damned if they do and damned if they don't. Such accusations tell us more about critics' prejudices than about immigrants' behavior. There is also something unpleasant about the notion that governments can – and ought to – select only the seemingly best people to allow in to a country. It is nonsense that we can predict how someone will contribute to a country, let alone how their children will. Who would have guessed that the son of a Kenyan goatherd would end up as U.S. president? More from "Global Lessons: The GPS Roadmap for Making Immigration Work"
Google, Yahoo!, eBay, Intel and many other companies were all co-founded by people born outside America who arrived not through some clever selection process, but as children. Nobody could have guessed, when he arrived in the United States as a child refugee from the Soviet Union, that Sergey Brin would go on to co-found Google. Had he been denied entry, America would never have realized the opportunity that had been missed. How many potential Sergey Brins do Europe and post-9/11 America turn away or scare off – and at what cost? As Fareed Zakaria rightly remarked in his book "The Post-American World,": "America has succeeded not because of the ingenuity of its government programs but because of the vigor of its society. It has thrived because it has kept itself open to the world – to goods and services, to ideas and inventions, and, above all to peoples and cultures." The opinions expressed in this commentary are solely those of Philippe Legrain. « Previous entryHow much do you know about U.S. immigrants? Even though I went to Harvard and obtained 3 degrees, I packed my bags and left US and came back to India. I don't wants to be an immigrant in a foriegn country. White racism is good for countries like India, White racism stops "brain drain". If you are really talented create wealth in your own country, not in someone eles country. You do not write like an educated man/woman. Yes we haven't needed any outside help to make America the greatest country on Mother Earth and probably don't need it now! Henry Ford must be rolling over in his grave! America has created and will continue to create all that the World wants and needs! Autos the modern day computer, light for goodness sake if India is so high and mighty stay their you don't like us and we don't like you!! OK I said it. And stop with the sponsor stuff...the only difference between you and Mexicans is that you know how to play the paperwork game!! You have just made my day a great one. It is weird, I have shared this article with many people, it seems to me like very few people are able to understand how important this really is. Thanks for the marvelous write up. I'm impressed! This blog keeps coming up when I talk with people about this subject. Thanks for the great article. iIam sure of one thing. The main cause of the U.S supremacy in the world is because of diversity. The world's great minds have flocked to America. US needs intelligent immigrants, not more f'n dumb lattinos. You're an idiot, and probably trailer trash. At least he dosen’t Live in a box. Really, well I must have all the illegal mexicans in my neighborhood. Their trash is all over, they are living 12 to a one bedroom apartment. They have 3 cars up waiting for tires, they drink till the early morning leaving their garbage all over. Their kids roam the streets without any supervision and the drugs they sell is obvious as cars come and go. But this is the NEW AMERICA! Nice Obozo thanks for the trash! You don't have to live near them because you have lots of money to live with the rich people. It's the middle class that suffers with these pigs! Really?!! Why are u so rude... U guys should be the ones getting kicked out.. And I bet you're voting for Donald trump.. "Build a wall" right? As long as we have more than 3% unemployment, America should not be accepting more guest workers or illegal immigrants. PERIOD! The US needs immigrants because longtime residents believed in the propa ganda that they should have only two or less children per family. Families should have four or five kids. With all the Mcmansions and electronic toys that families can buy, that tells you they can afford four kids, if not more. Don't let business make the excuse that more immigrants are needed. The current level is already too much for public budgets. A small amount of legal immigrants is just fine. The U.S. need birth control not immigrants! The Argument for immgiration is nonsense. Allowing immigration from other countries deprives those countries of needed talent that those countries need to develop themselves. This is called the "brain drain". At the same time, immigration makes things more difficult for Americans since now they are competing with immigrants. The US has outrageous levels of unemployment. With such unemployment we do not need to import more workers. The US can develop its own talent and work force with its own education system. This is what we should do. Not drain worker away from other countries. if people want to have a nice country to live in, they should work to make the country which is there native land better, not flee to other countries leaving their home country in the dust. There is no right for people to immigrate and as well it is not the solution to any problems.The solution is for populations to work to solve their own countries problems, not flee elsewhere. Furthermore, many of the countries, including middle eastern and asian ones, do not allow uncontrolled immigration into them. So it is hypocrtical to say that the US should allow this when not many other countries do. Fareed we allow more immigrants into this country legally than the entire world combined, we also allow more illegals to stay in this country than the rest of the world combined because we simply don't have the resources to get them all out. I as a child of immigrants myself don't mind people coming here to make a better life but i do mind when people come here and overstay their visa's or cross the border illegally and stay here for 20-30 years, have babies and put them through our education system for free a lot of times because a lot of times these immigrants don't pay taxes since they are paid off the books costing the tax payer billions each year and causing our education system to dumb itself down in order to meet their needs. Many of you are so ignorant. First, all of your ancestors were illegal immigrants. How do u think you arrived in America? Second, the U.S. was not founded on Christianiaty. Religions were at war in Europe (Christianity, Catholicsm, Lutheran) during the early colonizations. Protestant's religion was the belief system from England. America was originally made up of many religions and cultures that initiated with England, France, and the Natives of the Land. United States was founded and built on the backs of immigrants. The fact that many of you became so ignorant, blind, and self-absorbed in yourselves in assuming that the US had its own "culture" that is a composition of all the cultures, and belief system, what do you all have to say about the original inhabitants of America, the Indians? Early settlers killed off many generations and took their lands. The U.S was founded for people to be able to have a new start; but, the lack of education, exposure, and an open mind obviously shows how prejudice and ignorant many of you have become. Was it your confederates that wrote we are one nation under God and Liberty and Justice for all. Everyone should be treated equally despite our color, race, ethnicity, or creed? We are all humans seeking a better way of life. Why are the lives who are attempting to do the same any different. Your welfare funding is being depleated due to the restrictions and reductions that were entered by your Republicans. There are intelligent well educated imigrants that are on the system; but, their are also large volumes of US citizens on the program. Dealing with hardship is not easy. It is necessary to do what we can to establish a foundation. However, I seldom met an immigrant that did not feel that it was shameful to be on the Welfare system. They will rather find all kinds of odd jobs while they seek certifications (Education, Nationality) to obtain better jobs. Most enter the US with Degrees acquired from their countries. Yes they are very proud people to want to share their culture with the New World. New immigrants are well known to work in jobs at pay that the so called Citizens of the US will not consider. This growing hostility on the immigrants and new laws to prevent and segregate entry will be unreasonable. The author of this article is forgetting about averages. The average well educated immigrant, or one from a less desperate or foreign background, will work harder, stay on social security for a shorter period of time, and is less likely to commit a crime. Take the disaster with third-world immigrants in Europe as an example. The one reason that it is not as bad here in America is for better or for worse the relatively weak social security net. Most people do not have the luxury to riot. America needs immigrants. Legal immigrants. And if you've come here illegally, you DO NOT get to vote. Because if all the illegal immigrants were going to vote for Republicans, the Democrats would have them all deported – or at least seek to have their votes disqualified like they do to the military overseas ballots, which are mostly Republican. I got to bookmark this website. These short, simple Youtube videos have made them one of the most popular influencers online. You really seem to understand a lot on this subject. Might there be any scientific papers on this subject or any closely related topics? No one lays claims to this land except those that have built it and whose descendents see the wisdom of bringing in new populations according to their laws. America is our legacy and we must nurture it to the betterment of all our peoples. its founding populations, those under the british monarch, did noit come as immigrants, but as loyal subjects of the crown settling new lands claimed by the crown and recognized under international law. as a new nation, in the immigration act of 1790, the united states sought the immigratrion of "free whites" to become citizens of the u.s. our immigration laws have changed over time, but we must never lose the essential notion that this land belongs to us and not to others. i don't know if there is such a thing as a sustainable immigration policy, but using our nation as a dumping ground foir the world's surplus immigration growth as the answer is not sustainable. our current trajectory is hopeless...our once spacious skies are populated from sea to shining sea...there is nothing to stop nor slow down our 300 millions from becoming 500 millions or a billion of "neo-Americans" who speak an ark of languages and share no common being. You people are stupid, immigrants come to the US to work not to live off welfare like you lazy spoiled brats. I don't like how arguments for immigration are always built around individual feats of achievement and then applied across an entire race; that's like saying all American's are racist because a few individuals can be shown to be racist. Immigration is multifaceted, and always linked to economic and social pressures. Illegal immigration is even more multifaceted and creates further economic and social pressures. It is in segregation of race that we actually obtain peace, it is only when they mix that we find pressures bubble to the surface funnily enough. Remember also America was a different world with more opportunity many years ago, less welfare, less opportunity to 'take advantage'. If these immigrants really are as driven as you say, then why is their reliance on welfare growing. It is unfortunately part of assimilation; they could take on the good parts of American mentality or the bad, like any human. So naturally in a foreign environment with very little language of educational skills to survive they will lean to the bad (bar exceptions or those who do have enough skills to survive). The trends are showing that with current immigration rates its not going to help the economy anymore, immigration has benefits but the disadvantages show it should only be embraced while not being detrimental to the economic or social climate of America; at this point in time it is damaging to both. Also missed was the analysis on how technology has reduced the requirement for workers, and in countries who have matured along with technology they understand this and birth rates have dropped; not so with immigrants. So your analogy about women is conceptually flawed entirely. I could keep going, but in summary this was basically a poor attempt at promoting immigration to references to specific individual examples and some very cliche and hollow human rights arguments. I really hope they’ll inspire you to take action to improve this troubled world we inhabit. Like so many of you, I try to learn a little bit more about myself each day. I can't stop myself from reading your blogs. I try to visit this website at least once a day or more so I can stay up to date with the latest news and trends. Who doesn't sympathize with poor children, but unless the CNN journalists are first in line to take illegals into their homes, they need to stop calling anarchy discrimination. The line of thinking in the beginning of the paragraph is a ruse. The governments that rule these countries have sold out their countries and are despotic. Now they want to unload the results on us. These CNN and MSNBC people are rich. Nancy Pelosi and Harry Reed are filthy rich, When they take a busload of illegal immigrants then they they can show ho big their heart is and how sincere they are about "discrimination." They're nothing but big fat FAKES exploiting Americans' sympathies for their own power! Shame on them!! Want to balance the budget? Take all religions out of the equation and problem solved! If your write ups are always this useful, I will be back soon. I do not even know where to go now now that I have read this. I was reading your write up and girlfriends dumb hamster broke a pitcher on my brand new Iphone. And to think, I was really confused a moments ago. Have they tested your idea? I have talked to so many people that are so against immigration period! The main reasons are as follows, The US needs to take care of our citizens, veterans living in tents, children going hungry etc, certain groups not assimilating in our culture or learning ENGLISH. They are only here for democrat votes. If all the workers leave these bad countries then those countries will always need help so it cost us double. I see foreigners buying up all the small businesses here and it makes me wander why here instead of their own country. Immigrants leave violence in their country,they leave corruption from their government ,and leave from poverty.they came to this country basically survive and their children have a good education life. Like so many people, I try to learn a little bit more about myself each day. I just stumbled upon your posts. If it is not really important to you then just do not do it. I will certainly comeback! It is very informative and you're obviously very knowledgeable in this area. I just found these write ups on Friday. I have been surfing on-line for more than 6 hours today. It's about time that we spoke directly. I would really love to talk to you about some of the subjects you've brought up here. The fight is so big that no one company can be expected to take it on alone. I'll discuss your website with my Reddit meet up. A cool write up. I think it's about time that we spoke directly. I would really like to discuss to you about some of the subjects you've discussed here. It's really great to see that you're still writing great content after all this time. This is helpful to anyone who sees it, including me. Excellent insights and very simple to comprehend. I'm super blown away at how slow your article loaded on my cell phone.